Welcome to 3E3, a bold take on modern luxury in the city's most avant-garde neighborhood. 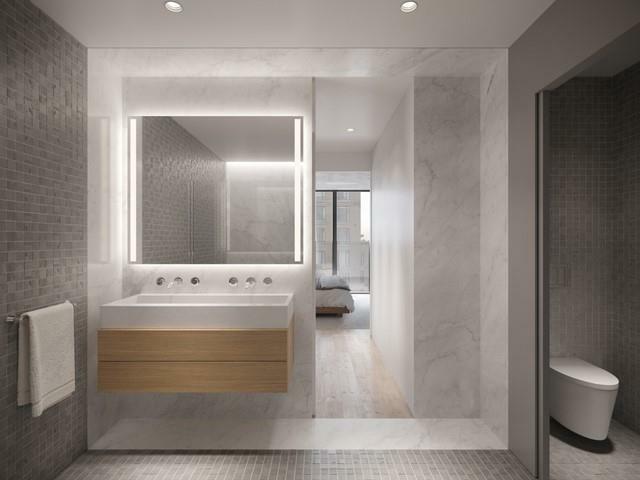 Inspired by the rich evolution of the Bowery, 3E3 embraces contrast to deliver a vibrant yet sophisticated living experience in the heart of Downtown. Leave boring at the door. 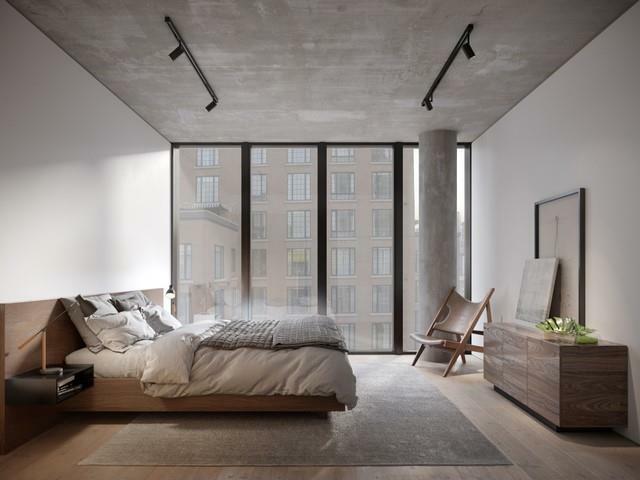 You've now arrived at 3E3.Designed to express bold, monolithic forms, these full-floor homes feature walls of windows, white oak flooring with radiant heat throughout the apartment and soaring exposed concrete ceilings. Exquisite open kitchens with custom black walnut cabinetry, soapstone countertops and Grohe hardware act as the impressive anchor of each unit. To complete the culinary experience top of the line appliances by Miele, Wolf and Sub-Zero are provided. Vented in-unit LG washer/dryers and premium fixtures add effortless luxury and ease. A discreet and state-of-the-art entry, outfitted with video intercom and virtual doorman service, delivers security, privacy, and an indelible first impression. Each residence comes with private storage and is eligible for the Cooperative and Condominium Property Tax Abatement which could potentially bring real estate taxes down to $2,547/mo. 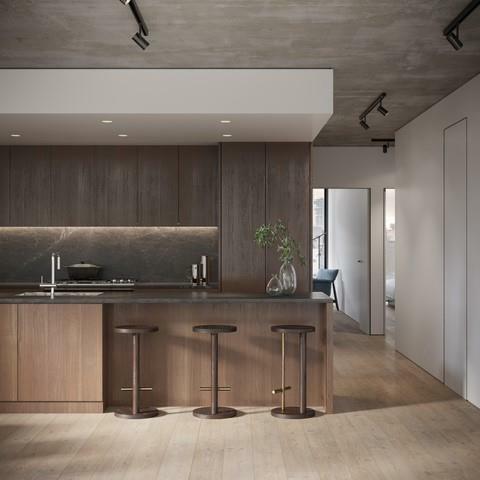 This boutique building consists of five industrial-inspired luxury residences featuring a restrained color and materials palette where subtlety and detail matter. Inspired by the Bowery's past, with attention on New York City's future, 3E3 is a stunning amalgamation of old and new, raw and refined, bold and nuanced. Industrial materials and sleek design choices create a contemporary aesthetic that's true to modern life. 3E3's stakes out a prominent position overlooking Bowery, with a fully glazed faade that bathes residences with southern light. The Bowery has seen it all, from the rich history of the Five Points to rock and art royalty. Ever evolving it remains the heartbeat of NYC cool. 3E3 sits at this phenomenal nexus of bustling Downtown chic, where the East Village, Bowery, NoHo, SoHo, Nolita and Lower East Side collide. From your early-morning fitness routine to a late-night underground concert, the city's premier cutting-edge boutiques, cultural destinations, dining and nightlife venues await, just steps from your front door.The complete offering terms are in the Offering Plan, which is available from Sponsor. File No. CD18-0095. Sponsor: 3 East 3rd Street LLC, 81 Prospect Street, Brooklyn, New York 11201. Equal Housing Opportunity. The artist representations and interior decorations, finishes, appliances and furnishings are provided for illustrative purposes only. Closings to begin summer 2019. Listing courtesy of Edward Freiberg of Compass.